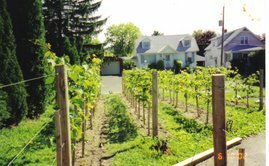 Growing vinifera wine grapes in the Northeast United States or any other cold-climate growing region, requires special effort. Vinifera grapes include the classic wine grape varieties such as Cabernet Sauvignon, Pinot Noir, Chardonnay, Merlot and Riesling to name just a few. Many people feel that these grapes make the best wine, including me. They are however, very susceptible to disease and cold temperatures. Although cold tolerance varies from variety to variety, as a general rule if your winter temperatures flirt with anything below zero Fahrenheit, you will need to protect your vines for winter. If your temperatures regularly get below -15 F, you may not want to attempt to grow vinifera grapes and choose French-American hybrids or other Hybrid varieties of wine grapes. They don't make as high quality wines as vinifera(in my opinion), but some of them can and do make excellent wine. In my vineyard the risk for temperatures well below -15 F exists. Fortunately it doesn't happen with any regularity. As a matter of fact I cringe as I write this because I feel like I'm "due" for some very cold weather since it hasn't happened in a few years now. Since the risk of these low temperatures is there I have to take precautions to protect my vineyard if I want to produce grapes every year. In my vineyard I have chosen to grow two vinifera varieties; Cabernet Franc and Riesling as well as two hybrid varieties; Marechal Foch and Regent. If I do experience very cold winter lows and it kills the buds on my vinifera, these two hybrids will likely survive and I won't go a vintage without making some "estate wine". The second precaution I take is protecting my my vines during winter. 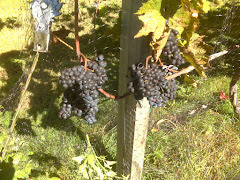 The vinifera varieties I've chosen to grow, Cabernet Franc and Riesling are the most hardy vinifera that I am aware of. They are both hardy to -5 F or a little colder and they will not be killed until the temperature drops below -16 F. Being "hardy" means that the temperature can drop to -5 F without the grower having to protect the vines in any way. Temperatures lower than that will begin to kill buds, wood and eventually the vine itself as it gets progressively colder. 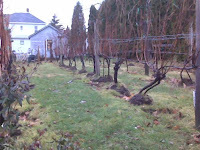 As the previous post I referred to details, I used to completely bury my vinifera vines each year. Burying vines will ensure their survival even in very cold climates where temperatures drop below what the vine can normally tolerate. It is also a lot of work! I would prune each vine to 4 or 5 canes in late November after thanksgiving. Then I'd bundle each vine using wire ties. I have my vines planted at about 45 degree angles using a "j" type training so that after bundling, I could carefully lay them down. I'd then dig a little trench so that the whole vine could lay flat on the ground. Then I would pin the vine to the ground using pins made from trellis wire. Next I would take dirt and mound up the graft union with about 4-6" of soil, burying the lower portion of the trunk and the graft union. After burying I would cover the whole vine with straw, canes and all. Like I said, it was a lot of work and I had to do that with more than 50 vines! Some vineyards in Minnesota do this for vineyards of thousands of vines, wow! It works though and it will protect your vines from winter injury if you want to grow vinifera in a cold climate. I have since changed my methods to a simpler, albeit riskier method of winter protection called "hilling up". This is commonly used in places like the Finger Lakes of New York and some Mid-Atlantic state vineyards. It's easier because all you are doing is mounding soil up around the graft union or scion of the vine. By protecting this part of the vine, the grafted vinifera wood, you ensure that a new shoot will grow even if the rest of the vine is killed by cold temperatures. This method works if there are many years between extremely cold low temps like in my vineyard. The nice thing here is that even by hand it only takes a few minutes to hill up a single vine. I can hill up all my vines in an hour or two. The third precaution I take is growing multiple trunks. Again, a technique used in the Finger Lakes and other areas. By allowing a new shoot to grow from the base of the vine each year you are basically upping the chances that one of these trunks will survive if very cold temps do occur. I have also taken it a step further. The shoot that has grown during the previous growing season is still very thin and flexible in the fall. It is easy to bend it down to the ground, lay it flat and pin it in place. A shovel full of dirt or two and it's covered. This provides a little form of insurance so that if perhaps, the rest of the exposed parts of the vine are killed, I have some one year old buds that will produce at least a small crop. The fourth precaution I take is kind of site-specific. 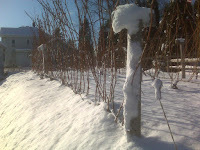 Since I have a small backyard vineyard and we generally receive a good amount of winter snow, I use it as insulation. By blowing as much of it as possible onto my vines, it acts as extra protection for the trunk and graft union. It rarely gets high enough to cover canes and cordons though, and you can't always count on it to be there when cold temps arrive, but it helps when it does come. So there you have it, that's how we "crazy" cold-climate growers fight old man winter. I'm sure anyone in California or other moderate growing regions who reads this is probably very appreciative that they don't have to deal with this stuff. It does take a lot of effort but I think it makes you appreciate the finished product even more. I think of it like the rich kid who has everything "handed to him from daddy" versus the poor kid who has to fight and claw his way to success. Which one appreciates what he has more? I know that when I pour a glass of Villa Ruzzo Cab Franc or Riesling, I can taste the work, effort and love that went into making it along with delicious fruit, earth, pears, petrol, blue stone and vanilla oak. But who knows, maybe it's just in my mind. Best wishes of the season. I have 400 plants I need to rpotect them for winter. Plastic really doesn't have any r-value to speak of. There are some growers who use foam insulation board that you can buy at lowes or home depot. It comeis 4X8 sheeis and is 1" or 2" Thick. You cut in the long way and make a tent or an a-frame out of it. 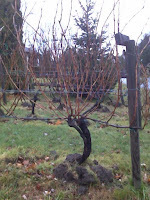 Lay your vines down and then puy the a-frame over them and anchor it in place. I hear it works great. I've used straw too, which works fine but is messy to clean up in spring. Hope this helps. great insight into the world of wine and winter! i was just wondering if many vines are lost in the burying process( rot, pest,cold).